Sounding a deeply populist note, former Gov. Rick Perry on Wednesday launched an offensive against banks that are too big to fail, making a pitch for Wall Street reform while tying the 2008 financial crisis to Democratic presidential front-runner Hillary Clinton. Warning that the "next crash is on the horizon," Perry used a New York speech to position himself as the only candidate with the economic record to to reverse an era of Wall Street run amok, enabled by complicit politicians. "If you elect me president, I will reform Wall Street and I will reform Washington," Perry declared, later promising not to "bail out a single bank on Wall Street." Perry had particularly harsh words for Clinton, whom he said must answer for her husband's economic policies as she wages her own 2016 campaign. In an extensive critique, Perry linked the 2008 housing collapse to Bill Clinton's efforts to expand the ranks of homeowners in the United States. "If Secretary Clinton wants to take credit for the 'Clinton economy,' then she must defend the destructive home ownership policies advocated by her husband that pushed shoddy loans to people couldn't afford them, and the economic chaos that pursued," Perry said. The speech, held at the ritzy Yale Club in Manhattan, featured some of Perry's most populist language since he launched his campaign. "After the bailouts of 2008, Americans came to believe that Wall Street is out for itself. That the game is rigged. That the wealthy and the well-connected have insurmountable advantages over average Americans who simply work hard and play by the rules," Perry said, conjuring the specter of a "special political class that spends large sums of money to wield influence, to protect entrenched interests, to advocate for special favors at the expense of taxpayers and the general public." Among Perry's ideas to overhaul Wall Street's ways: strengthening a new rule from the Federal Reserve that requires America's biggest banks to maintain "financial cushions in case of another downturn." He also proposed that large financial institutions disentangle some of their services, reducing the risk of a full-blown collapse in times of crisis. Perry put a personal touch on his proposals, advocating for community banks like the one whose board he served on in Haskell, Texas, to be exempt from financial regulations under the Dodd-Frank Act. Along with that, he pushed for more congressional oversight of the Consumer Financial Protection Bureau, which was created by Dodd-Frank. Throughout the speech, Perry took swipes at Democrats, including Clinton, for having a backward view of the future of the U.S. economy. "Democrats have a 1915 view of the 2015 economy," Perry said, accusing them of building a costly "toll bridge to the 21st century." He specifically went after Clinton for her support for raising capital gains taxes, noting that she once opposed the idea and that her husband cut the taxes in 1990s. Tapping into disagreements within the Democratic Party, Perry suggested Clinton now backs raising capital gains taxes as a result of "Warrenism," a reference to Massachusetts Sen. Elizabeth Warren, who has urged her fellow Democrats to be tougher on big banks. Perry also used the speech to reiterate his own economic record, touting Texas' job growth during a Great Recession that wreaked havoc on the housing markets in other states. He specifically cited a recent report that attributed some of the job growth in Florida under then-Gov. Jeb Bush to a housing bubble. Perry has been sparring with Bush over the mantle of job-creating governor. 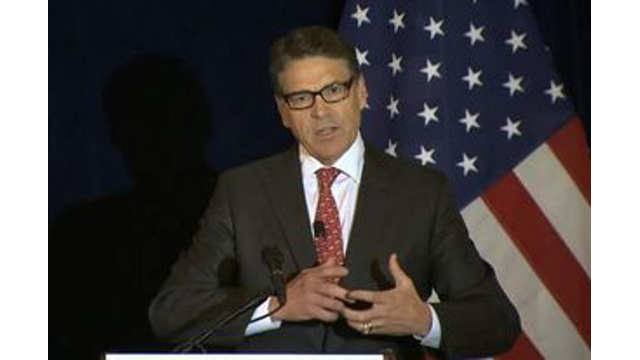 Unlike his GOP foes, Perry said he was not among the "Washington insiders running for president." And in his latest jab at the several senators vying for the Republican nomination, Perry pointed to his experience as a governor "who was not one vote out of 100, but one out of one when a bill came to his desk." Perry's appearance at the Yale Club was otherwise largely focused on policy, though he briefly weighed in on a topic currently consuming the 2016 race: the candidacy of bombastic billionaire Donald Trump. Asked about Trump's most recent insults against him, Perry quipped to a reporter, "Let's get a pull-up bar out here and see who can do the most pull-ups." Perry's speech was organized by the Committee to Unleash Prosperity, a group of conservative economists long supportive of the former governor. The committee, which is not endorsing in the 2016 race, has been hosting forums with GOP candidates in New York.